This is a new composite image of galaxy cluster MS0735.6+7421, located about 2.6 billion light-years away in the constellation Camelopardalis. 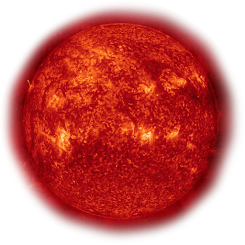 The three views of the region were taken with NASA's Hubble Space Telescope in Feb. 2006, NASA's Chandra X-ray Observatory in Nov. 2003, and NRAO's Very Large Array in Oct. 2004. The Hubble image shows dozens of galaxies bound together by gravity. In Jan. 2005, astronomers reported that a supermassive black hole, lurking in the central bright galaxy, generated the most powerful outburst seen in the universe. The VLA radio image shows jets of high energy particles (in red) streaming from the black hole. 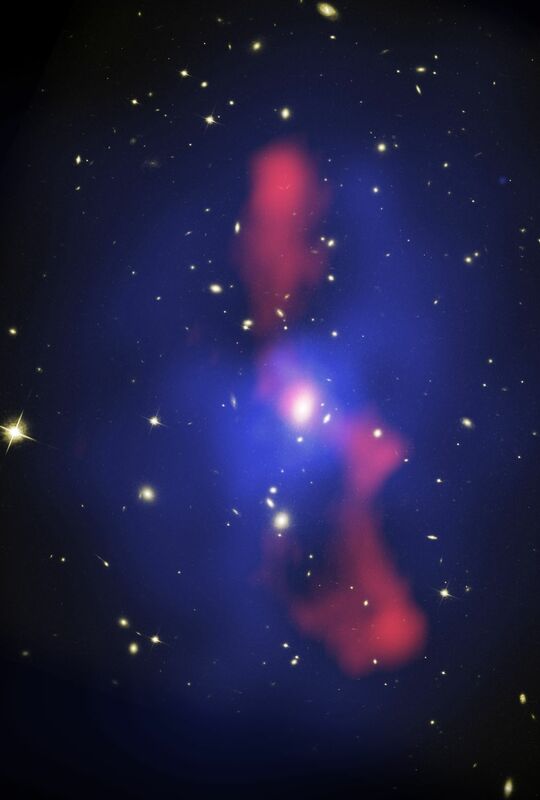 These jets pushed the X-ray emitting hot gas (shown in blue in the Chandra image) aside to create two giant cavities in the gas. The cavities are evidence for the massive eruption. The X-ray and radio images show the enormous appetite of large black holes and the profound impact they have on their surroundings.